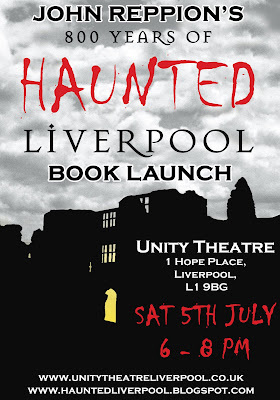 800 Years of Haunted Liverpool will be officially launched at the Unity Theatre in Liverpool on Saturday the 5th of July 2008 between 6 and 8pm. The Unity bar is fully licensed with Cains Bitter on tap. I'll do my very best to give a short talk giving a bit of background on how the book came about and what it was like to work on. Limited edition copies of 800 Years of Haunted Liverpool will be on sale for £9.99. If you do plan on coming, please drop me an email at haunted_liverpool@btinternet.com as places will be limited.